This contrasts with brands’ publicity of efforts in energy conservation & clean production; how can they improve? This article was first published on the IPE (Institute of Public & Environmental Affairs) website on 12 March 2018. Click here to read the original publication. Since 2002, China has been the world’s largest beer producer and consumer. In 2016, China’s annual beer production exceeded 45.06 billion litres, totalling about twice as much as that of the US, the world’s second largest producer. Annual per capita beer sales topped 35 litres, surpassing the world’s average (26.4 litres/person). 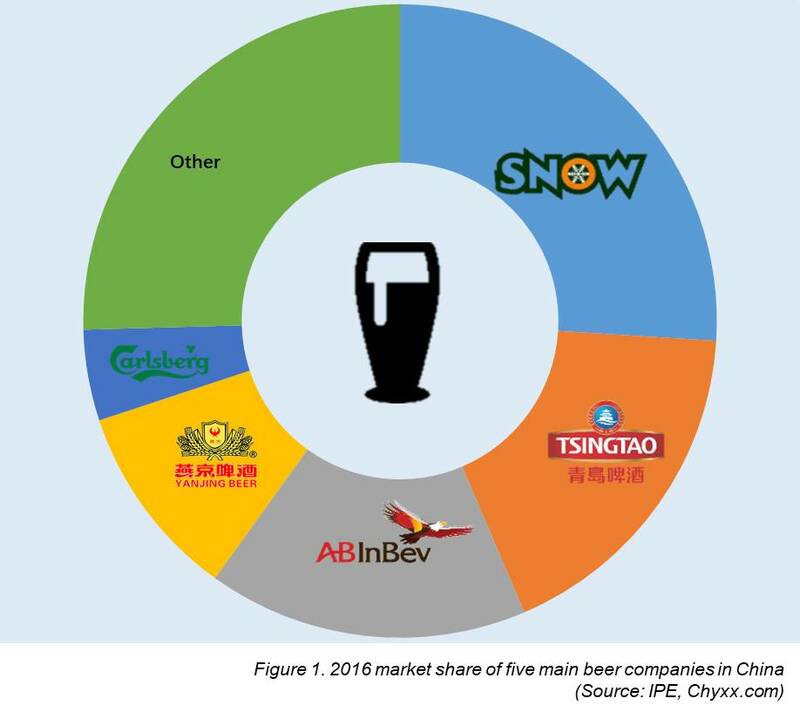 At present, China’s beer industry is monopolised by five major brands: China Resources Snow (“CR Snow”), Tsingtao Beer, Anheuser-Busch InBev (“AB InBev”), Yanjing Beer and Carlsberg. In 2016, these five companies comprised over 75% of the market, with the largest domestic beer enterprise – CR Snow – accounting for 26% (see Figure 1). With the beer industry making great strides, China’s domestic market has entered into a slump since 2014. Ageing populations, increasing incomes and structural changes in market demand have led to a continuous decline in beer production. On the other hand, between 2011 and 2016, the total amount of imported beer, which is dominated by high-end products, has increased tenfold. Craft beer has grown at a rate of around 40%. A variety of taprooms and craft brewing labels have rapidly emerged: Beijing-based Panda Brewing, NBeer, and Jing A, as well as The Brew and Boxing Cat in Shanghai, have all become familiar names for beer lovers. Traditional beer brands are facing immense market challenges…. These trends highlight that consumer stickiness toward traditional beer brands has diminished, and consumption patterns are becoming increasingly fragmented and individualised. Traditional beer brands are facing immense market challenges. Major beer brands are gradually shifting toward the high-end market, where consumption is increasing. Their operating conditions have generally improved since the end of 2016. China’s beer industry is currently ushering in a period of deep consolidation. Product quality upgrades and innovation in production technologies will be two major tests that beer companies must face. As early as 2010, China’s Ministry of Environmental Protection formulated the Cleaner Production Audit Guideline – Brewing Industry (Draft for Comment), which pointed out the beer industry’s low resource and energy use efficiency, severe environmental pollution, and low economic efficiency. The industry needs to implement a more robust sustainable development model based on circular economy and strengthening cleaner production. However, when compared to other traditional heavy industries such as cement and iron & steel, the beer industry’s environmental issues have yet to attract widespread attention. Beers typically use two types of packaging: cans and bottles. Among these two types, bottled beer – which accounts for over 90% of beer – mainly consists of the four components of beer, bottles, caps, and labelling. The required raw materials, production process, and key pollution emissions impacts can be seen in Figure 2 below. China’s largest beer enterprise, CR Snow, has a total of 98 factories in China. Among these factories, 23 sites have had issues with wastewater and/or air emissions exceeding legal standards and procedural violations since 2014. In its 2016 Corporate Social Responsibility (CSR) Report, CR Snow boasted of its total investment in environmental protection and that it has “established a sound three-level environmental management system comprising of the headquarters, regional offices and factories” (Figure 4). However, many of its subsidiary factories have received environmental violations, showing that CR Snow has not yet achieved environmental compliance in its production, and urgently needs to improve the environmental performance of its subsidiaries. Tsingtao Beer and Yanjing Beer have 15 and 14 subsidiary breweries, respectively, that have been subject to environmental violations since 2014. Yanjing Beer (Laizhou) Co., Ltd. has also been punished 20 consecutive times since 2014 for its lack of denitrification equipment and its particulate emissions exceeding standards. In 2016, the factory was fined RMB117.93mn for directly discharging a portion of production wastewater from its brewing plant and all of the production wastewater from its draught beer workshop into the environment without first treating it. This discrepancy has meant that Yanjing Beer was featured in Southern Weekend’s 2016 “China Greenwashers List” as a result of its subsidiary factories’ repeated violations. 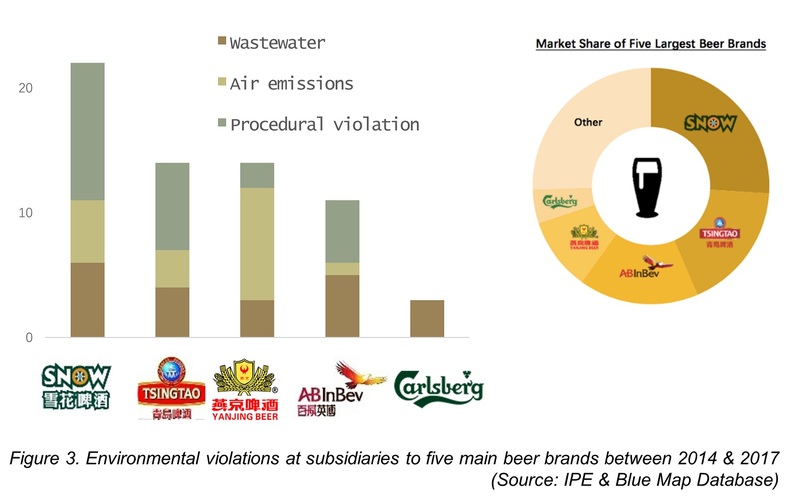 The two companies with the lowest market share in China – AB InBev and Carlsberg – were found to have five and three subsidiaries, respectively, that received violations since 2014 for issues such as wastewater noncompliance. Of these two companies, Carlsberg’s subsidiary, Chongqing Brewery Co., Ltd. (Mawangxiang), was the subject of official public reports in 2015 due to its excessive odor and noise pollution. 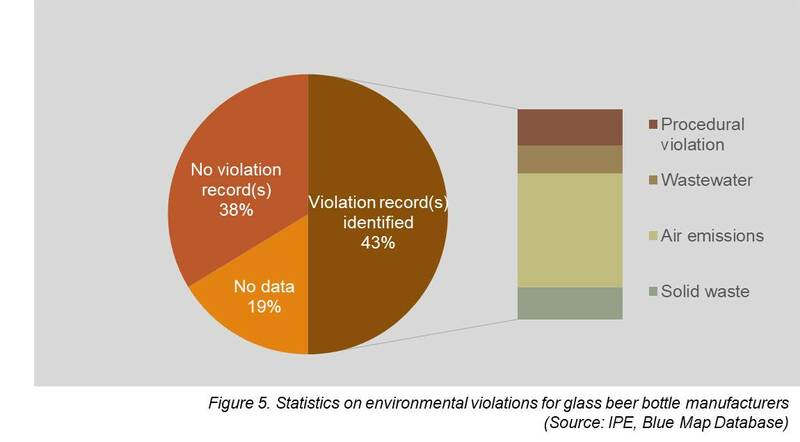 An environmental compliance screening conducted on 81 glass beer bottle manufacturers (including those on the list of beer bottle quality inspection results published by the General Administration of Quality Supervision, Inspection and Quarantine in 2012) found that 35 of these enterprises have been subject to environmental violations since 2014. Among these factories, over 71% of environmental supervision records were issued for reasons relating to air emissions (see Figure 5), including for such issues as SO2, NOX, and particulate emissions exceeding legal standards, irregular operation or idling of air pollution treatment equipment, and construction of monitoring equipment out of accordance with standards. It is worth mentioning that many large-scale daily-glass manufacturers are suspected bottle suppliers to the top-five beer brands. 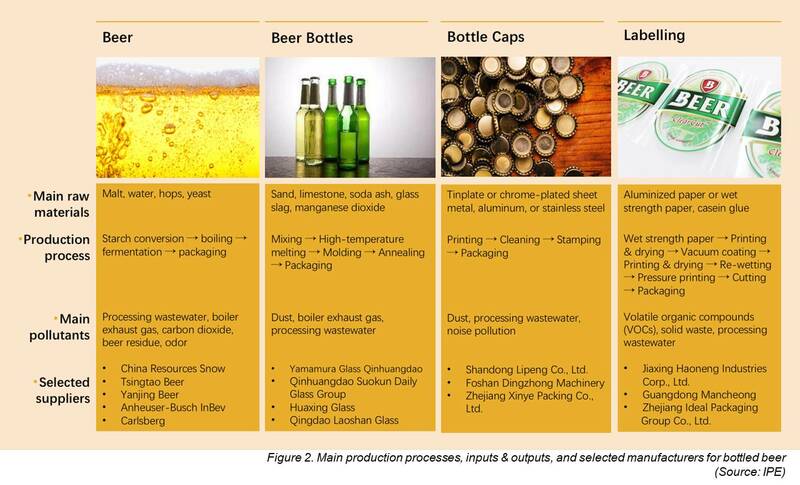 Among these companies, AB InBev’s suspected supplier, Yamamura Glass Qinhuangdao Co., Ltd., was fined RMB12.47mn in April 2016 for refusing to correct such problems as its air emissions exceeding pollutant standards and not obtaining a permit for its air emissions. 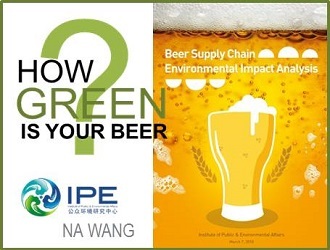 In order to promote beer brands to focus on the environmental violations of their subsidiaries and suppliers, IPE twice sent letters to CR Snow, Tsingtao Beer, Yanjing Beer, AB InBev, and Carlsberg at the end of 2017 and the beginning of 2018. IPE hopes these five major brands could push their problem suppliers to issue public explanations about the reasons for their environmental violations and corrective measures adopted to address them. Up through March 2018, IPE had received initial explanations via a call from Yanjing Beer and a single response e-mail from Tsingtao Beer. Major beer brands generally disregard the environmental compliance of their suppliers in China, leading the beer industry to collectively score low on the Corporate Information Transparency Index (CITI), falling far behind the IT and textile & apparel industries. This situation contrasts sharply with multiple beer brands’ publicity of their efforts in energy conservation and cleaner production, as well as the green image that they cultivate. Improve the disclosure of environmental information, and communicate to the public about how the brand manages the environmental impacts of beer production throughout the entire life cycle. Na Wang is Senior Project Officer of The Institute of Public & Environmental Affairs (IPE), which is a non-profit environmental research organization dedicated itself to collecting, collating and analyzing government and corporate environmental information to build a database of environmental information. She specialises in research and analysis of green supply chain (GSC) in China. Her recent work focuses on GSC at beer, cement, and automobile industry.